ET Armies is a sci-fi FPS developed by Iranian studio Raspina that's set to come to Steam in early March. Ahead of its release, the studio is offering free copies of the full game to randomly-selected followers, whose names will be drawn on February 26. Play ET Armies at the PC Gamer Weekender in London from March 5-6. Click here to find out more. ET Armies is set in the distant future, after the Earth has been stripped of its resources and abandoned by everyone who could afford to leave. Those left behind were forced to unite in order to survive against a ruthless enemy known as the Forsaken, who for some reason are prepared to fight and die for what is supposed to be a barren, worthless hunk of rock. 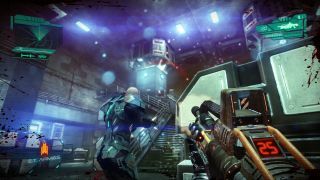 One of the reasons it's taken so long to get from there to here may be that it simply wasn't legal to offer the game in most Western markets because of trade sanctions that were in place against Iran: Publisher Merge Games told Blue's that the forthcoming Steam release is the “direct result” of the recent lifting of those sanctions. ET Armies is slated to give live on Steam on March 3, and will cost $15/£11. It will also be playable at the upcoming PC Gamer Weekender event, running from March 5-6 in London.